One of India's premier labour organisations, New Trade Union Initiative (NTUI), even as condemning the constitution and publication of the National Register of Citizens (NRC) in the Assam rendering 40 lakh people without citizenship and therefore effectively stateless, has said that the whole effort is to target the marginalized sections of the population, including workers, migrants, Muslims and other minorities. Signed by Gautam Mody, NTUI General Secretary, the statement says, rightwing political forces are involved in pittinig one section of the people against another, which led to insecurity among people, even as reflecting the authorities' inability to provide a safe and secure life. The history of the NRC dates back to 1951. Given the demographic composition of the state of Assam, large parts would have gone to East Pakistan at the time of partition. This was apparent from the Sylhet Referendum. However, in order to satisfy the Assamese Hindu elite to retain their lands, the Boundary Commission, that drew the boundaries to partition undivided India, was persuaded to include the districts of the Barak valley in India. While on the one hand it allowed the retention of land by the Assamese elite, it created tensions between this elite and the Bengali speaking minority, on the other. The fear of this elite of being dominated by the Bengali speaking minority led to the constitution of the NRC to seal the citizenship issue. This further triggered the aggressive movement for promotion of the Assamese language and identity and created the grounds for a Hindu majority state. The institutionalised fear and sense of persecution persisted over generations and magnified manifold with the rise of strong Assamese chauvinist forces in the 1970s led by the All Assam Students Union (AASU) against alleged ‘illegal infiltration’ of citizens of the war torn newly created country of Bangladesh. This led to the extreme, and often violent, movement against ‘Bengalis’ in the state including the massacre at Nellie in 1983 in which over two thousand people were killed. In 1983, the Indira Gandhi government, enacted the Illegal Migrants Determination by Tribunal Act (IMDT) for Assam that created procedure for identification of ‘illegal immigrants’ to prevent the undue harassment of Muslims in the state during the Assam agitations. The continuing intensification of the agitation of indigenous Assamese, however, finally pushed the Government of India to intervene and sign the Assam Accord with the All-Assam Students Union (AASU) in 1985. This Accord again set a time bar on citizenship. Those who could prove that they or their ancestors entered the state from outside the country before midnight March 24, 1971 – one day before Bangladesh declared its independence from Pakistan – will be considered citizens of India. This put the onus of proving residency and citizenship on a large number of people who are marginalised, mostly illiterate and with very little access to government. The IMTD was however struck down by the Supreme Court in 2005 in the Sarbananda Sonowal vs Union of India case. It is not surprising that the present phase of attack against the Bengali Muslims is being led by the BJP Chief Minister, Sarbananda Sonowal! 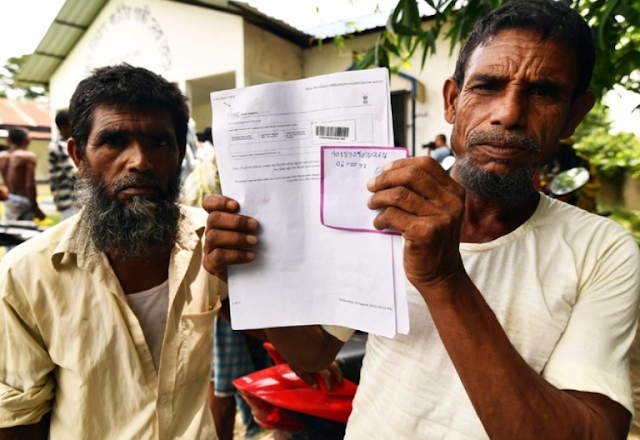 Following the Supreme Court ruling, the Congress government in Assam and the UPA government at the centre in a tripartite agreement with AASU agreed to update the 1951 NRC, within two years, with March 2, 1971 as the cut-off date. Work on this only began much later after the Supreme Court directive of 2014 that directed the Government of Assam to set up as many as 100 Foreigners’ Tribunals to review about 40,000 cases of people suspected by the state border police of being “illegal Bangladeshi(s)” who were forced into detention in camps. There is a difference between the earlier attacks and the present process of publishing the NRC. Previously the attack against the ‘illegal immigrants’ was aimed at ‘Bengalis’ as a linguistic community with the attack against the Bengali Muslim being an underlying definer. Since the 2014 general election however, the attack is clearly against Muslims as ‘outsiders’. This is the effect of the polarisation fuelled by the BJP in an already volatile society in the run up to the 2016 state elections and aggressively pursued when they came to government. As many as 3.29 crore individuals from 68.27 lakh families submitted over 6.5 crore documents with the government of Assam to prove their citizenship. Documents of over 40 lakh persons have been found inadequate. In a society that is highly polarised for decades against minorities and against the poor, ability to access legal identity documents in itself is not a procedure that goes in favour of the working class, migrants, Muslims and other minorities. The fate of the 40 lakh people excluded from the NRC, many of them already in the inhuman detention camps, lies now in the hands of the Foreigners’ Tribunals with the threat of deportation looming large on them with no place to go to. The NRC provides the ‘legitimate’ cover for ‘elimination’ of minorities. The lynchings in Assam and elsewhere in the country institutionalise and legitimise this ‘elimination’ in society at large. The lynchings derive their support across the country from the BJP leadership. The NRC, therefore, is not just a register that threatens the citizenship and livelihood of people living in the state for several decades, it is also a document that will legitimise violence against minorities who are mostly Muslims, migrants including those from Nepal, and historically oppressed castes and communities. All borders across the world are porous. Our borders with Nepal, Bhutan and China are porous too. The porosity of the borders with Bangladesh and Pakistan, however, is always advanced by the Hindu right in order to create an environment against Muslims as the other. Through human history, people have migrated at different points of time for economic, social and political reasons. Many more, did not migrate but were moved by forces of state and capital. In the case of Assam and other parts of east and north-east India large numbers of people were moved during the colonial period, to work on tea plantations and to farm the land. Of course, people also migrate in search for a better life. It is the flow and counter-flow of language and culture that has made our societies what they are. But when it comes to ‘Bengali Muslims’ they have been branded as ‘outsiders’ and ‘infiltrators’. The BJP government at the Centre sought to legislate the Citizenship (Amendment) Bill, 2016 in parliament to give Indian nationality to Sikhs, Parsis, Buddhists, Jains, Christians and Hindus, to the exclusion of Muslims, living in other countries and facing religious persecution, exclusively including those from Bangladesh, Pakistan and Afghanistan. Clearly, the effort is to portray our Muslim majority neighbouring countries as the ‘other’, as societies that oppress those of other faiths. This is part of BJP’s Hindutva agenda to construct a Hindu majoritarian identity exclusively in opposition to Islam. The ability of rightwing political forces across the world to pitch one section of the people against another is rooted in the insecurity of the people, their inability to provide for their own and their inability to have a safe and secure life. The anti-immigrant sentiment across the world today is not because the immigrants are displacing local workers from their jobs and livelihood, but because governments across the world are failing to create jobs and failing in their responsibility to provide for people’s basic needs. For the right wing, pitching one section of the workers against another, one section of society against another is the way to make political and especially electoral gains. On the one hand, the right wing employs the threat of immigration for its own expansion and on the other, capital uses immigrants to drive down wages and conditions of work. This capital-state relationship requires immigrants to be kept vulnerable so that they can be exploited. The NRC in Assam is as an outcome of this economic paradigm as much as it is a result of chauvinism and the rise of the right. Successive governments of Assam have failed to create jobs in the state. Almost half of the state’s total workforce and 75% of the total population is directly or indirectly still engaged in agriculture and allied activities for their livelihood, even though the sector’s share was just about 20% in gross state domestic product (GSDP) in 2014-15. Industry’s share in GSDP was just 18% 2014-15. Hence over 60% of economic activity comes from the low value added and low paying service sector. According to a study conducted by the North Eastern Development Finance Corporation Limited for the Assam State Rural Livelihood Mission, the state must create over 1.75 lakh jobs every year till 2020 which it is nowhere near achieving. According to the fifth Annual Employment-Unemployment Survey (2015-16) three times as many Assamese are unemployed as compared to the country-wide average. This macroeconomic and employment situation makes the working class of Assam, as that of the other states of the north-east prey to extraordinary exploitation by capital. This vulnerability when combined with prejudice causes fear on one side and hatred on the other. Since the publication of the NRC on Monday, the BJP has done its best to raise the pitch through its President, on the floor of parliament, to link the issue of NRC to the question of national security. Other leaders of the BJP across eastern and north-eastern India, especially in West Bengal, have called for NRC in other states too. For the BJP this is yet another opportunity to spread hate and instil fear. The parts of Assam that have a large Muslim population have been brought under strict armed police control accentuating peoples’ fear and prejudices. The answer to movement of people over time is not the NRC or the border wall whether it is against the ‘Bangladeshi’ in Assam or against the ‘Mexican’ in the US but to find humane solutions that are acceptable under the UN Declaration of Human Rights. The NRC must in its present form be annulled and the onus of proof of non-citizenship must rest with government. For other residents government must ensure the rights of residence and the right to work. And in the struggle for this the NTUI stands with its membership in the state of Assam and with all working and discriminated peoples of Assam.